There’s no need to have a sit-down dinner every night in Thailand. In fact, you really should save an evening to stuff yourself full of street food specialties at a night market. 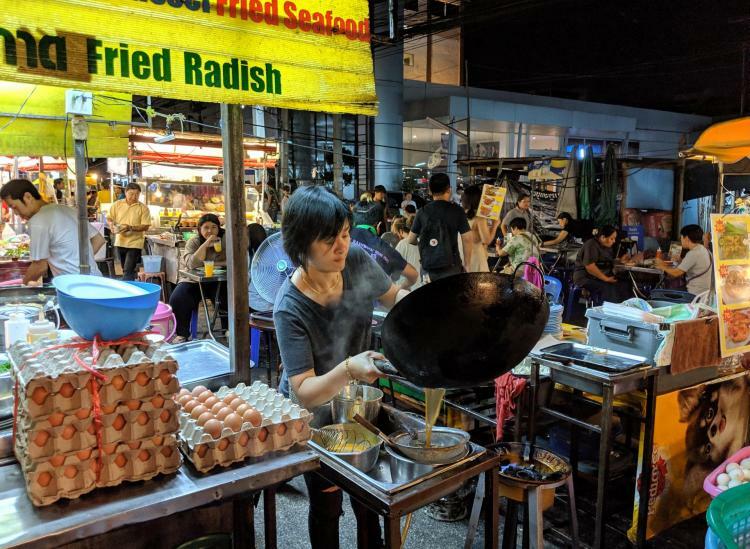 When it starts to get dark in Bangkok, Chiang Mai and many other cities across the country, the food scene starts sizzling. 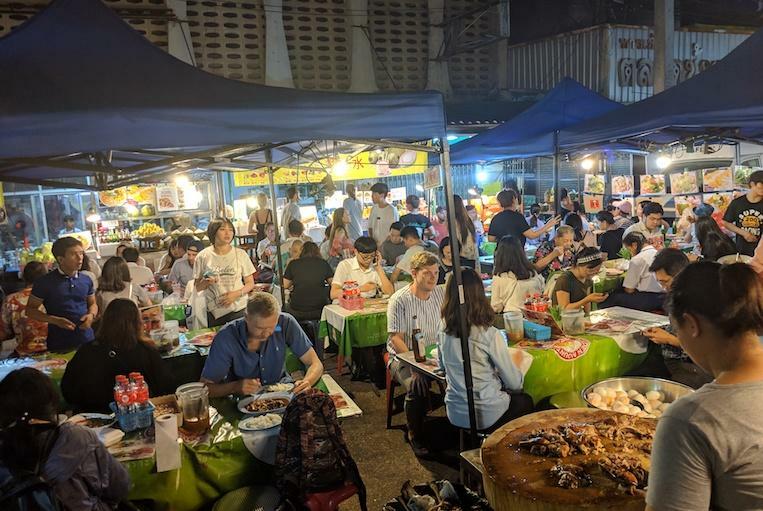 The night markets are a casual feast for the senses. You’ll smell the frying oil and fresh fish as soon as you get within a few steps of the food stalls. And you’ll hear the bustle of locals snagging a snapper from their regular fishmonger or tourists oohing and ahhing over shiny squid. 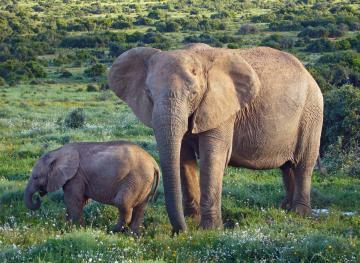 But there are no eating rules here like you might find at a fine dining spread. Eat dessert first, have as many forms of shrimp as possible or eat pineapple in every dish — whatever hits the spot. Although you’ll likely find souvenir shopping opportunities as well, we’re focusing on the food because we’re hungry after dark. 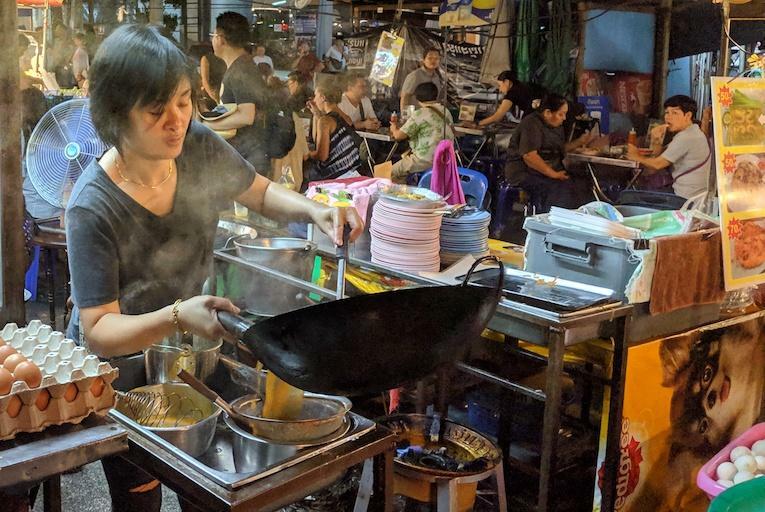 Here’s what’s on our foodie to-do list for the Thai night markets. Play “I Spy” with all the tropical foods. Let’s be real — in the United States, we can be a bit starved for tropical foods. No matter how many dragonfruits you might spot at your local Whole Foods, it’s just not the same as spotting one where it feels like it could have been picked earlier that day. The same goes for seafood. Frozen shrimp just doesn’t cut it. Drink a fresh fruit smoothie. We’re pretty sure you’re required to eat some mango, pineapple or banana every day during a trip to Thailand. And what better way than in smoothie form? You can pick your fruit combo and watch it be blended into a yummy treat right before your eyes. 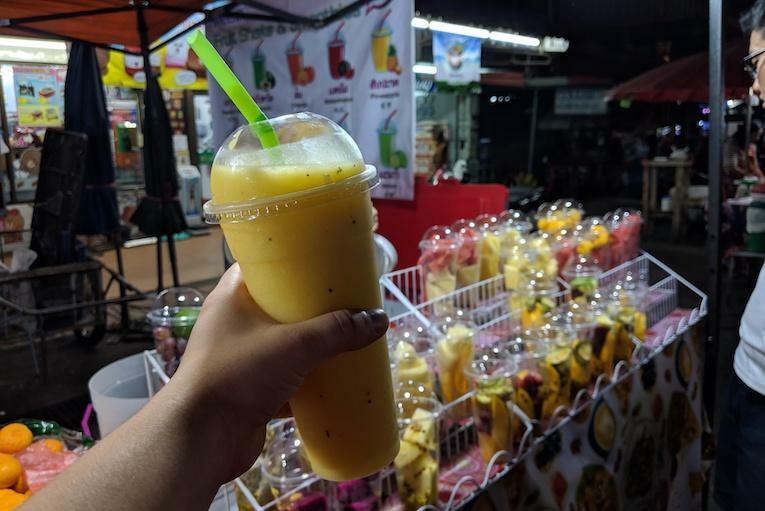 A word to the wise: If you’re worried about water consumption (tap water is off limits in Thailand), watch for locals purchasing a smoothie at the stand you’re considering. That’s the easiest way to judge whether the ice used in your smoothie will be trustworthy. Watch the experts work the woks. The chefs at the markets really know how to wield a wok. They’re cooking over an open flame with a giant pan in hand, and you get to watch them swing it around like it’s nothing. If you can get close enough (but please not close enough to burn), listen for the satisfying sizzle when a cook cracks an egg into a hot wok. 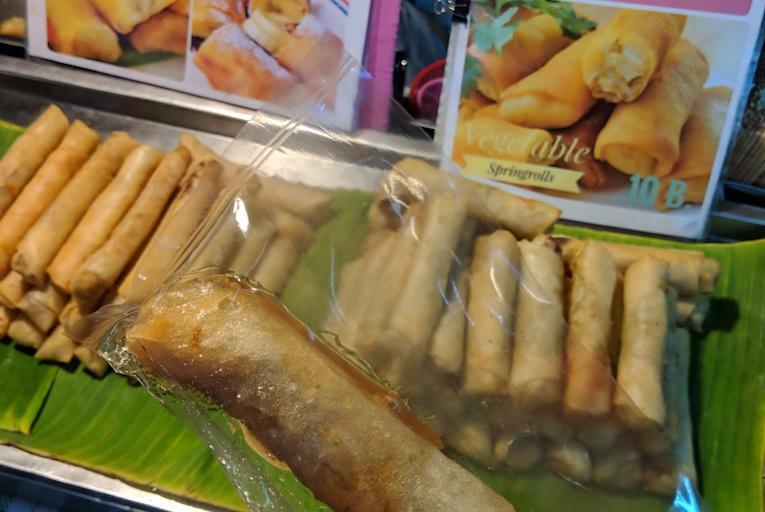 We love a good fried treat, and spring rolls are a classic. But you haven’t eaten a spring roll until you’ve picked one up from a Thai market stall. Helpfully, many will bag your roll so you can take it on the road — with some sauce drizzled inside for less mess. Check out all the fish and seafood. Squid? Check. Blue crab? Check. Giant shrimp? Okay, they’re prawns (bigger, meatier shrimp), but still, the markets will have them. It’s rare to see a seafood selection so extensive and ready to be cooked into something delectable at home in the States. 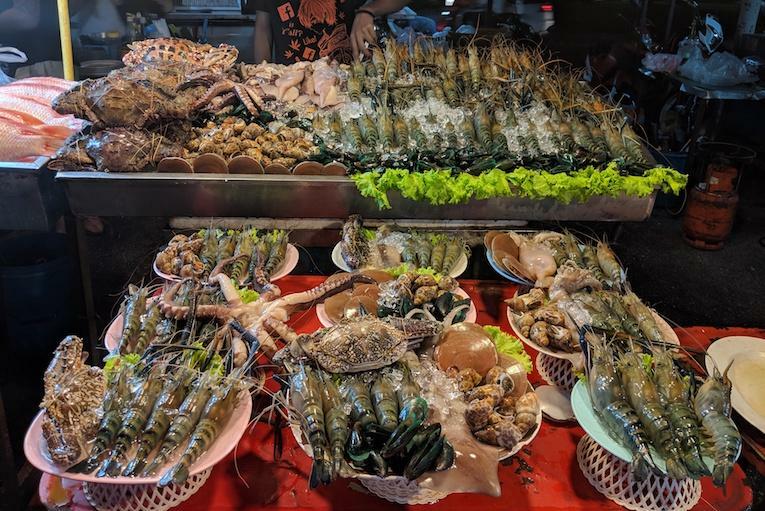 However, in Thailand, you can find just about anything from the sea that you want to dine on. Hello, fish dinners. You can grab a helping of the most famous Thai dish (stir-fried noodles, peanuts and scallions) straight from the wok at the markets. Even more fun? You can watch it being cooked, from the empty wok to the final product on your plate. It’s much more fun than a restaurant hiding the fun scramble in a back kitchen. There’s bound to be something on the grill at a tempting food stand at the market. And a late-night snack is the perfect time for experimentation. 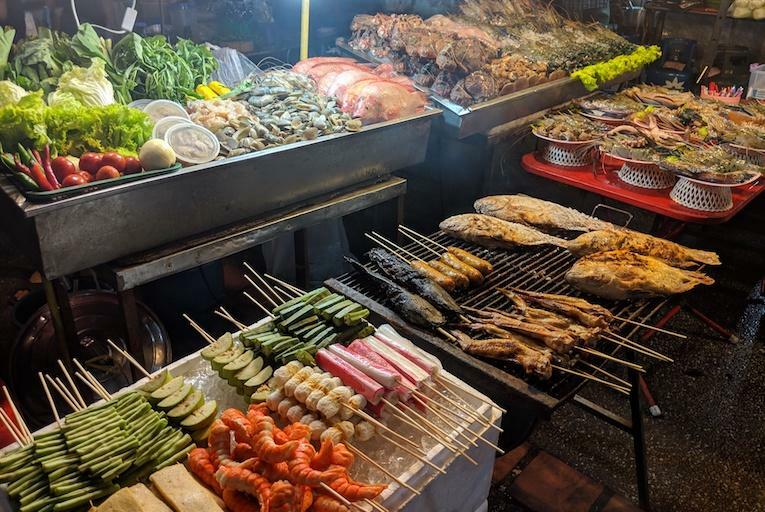 Whether you go for something fresh or fried, veggie or carnivorous, we’re sure something smelling unmissable will call to you as you wander through the market. Don’t chicken out — it’ll be worth it. 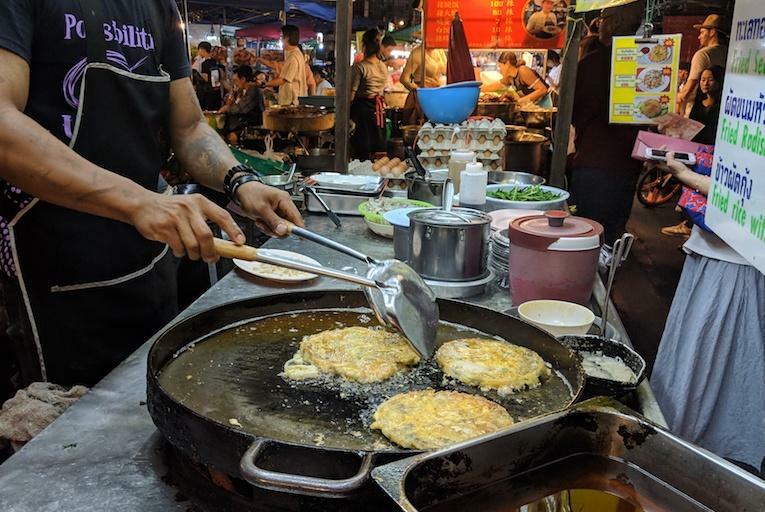 Thai omelets, known as khai jiao, are popular street food and can be filled with veggies, meat or even seafood. Talk about packing a protein punch! The omelets are fried in bubbling oil, and the chef will spoon even more on top while it’s cooking for an extra crispy indulgence. 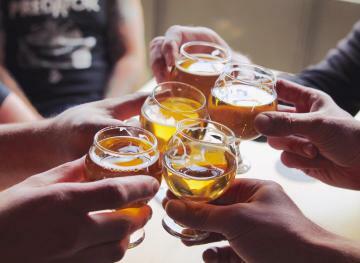 Share a table with locals. While some foods are on-the-go cuisine, others require a fork and spoon to eat. So grab a table, bench or plastic chair and chow down. You’ll probably end up sharing your space with other eaters, including locals who know what’s good. People-watching rules say it’s okay to peep at someone else’s plate to get ideas for your next snack. Eat lots of mango sticky rice. 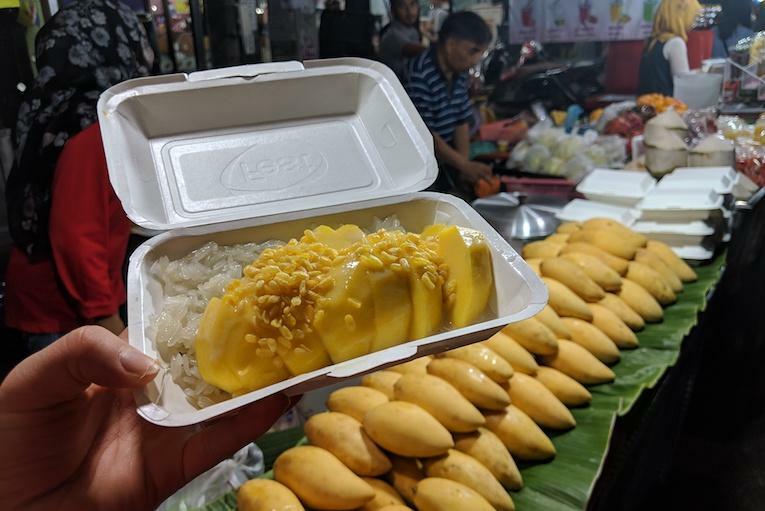 Whatever you do, don’t leave the market without noshing on some mango sticky rice. We love everything mango, but this dessert dish really takes the cake. The sweet mango and creamy rice will cure even the most brutal sweet tooth. But we can’t promise you won’t crave this delight again the next day. Or even the next hour. No judgment — we’re having seconds. too. Wondering about food safety? Here’s the real deal before you go. 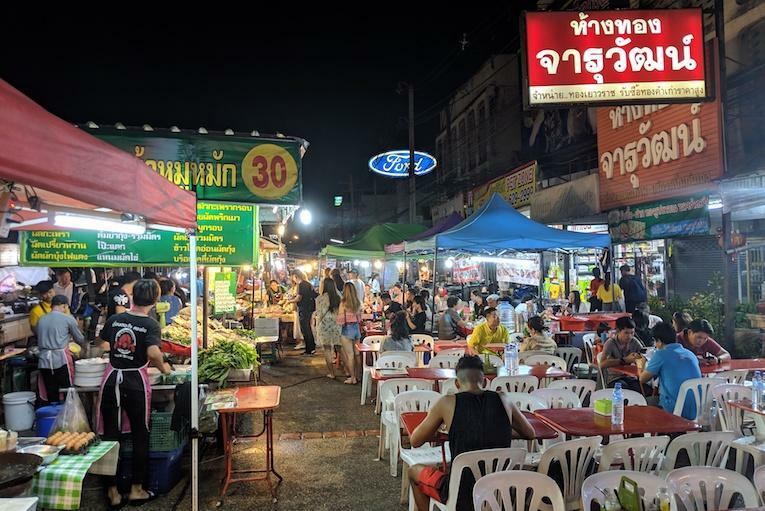 The idea of “street food” can stress some travelers out, especially when you see big bowls of raw meat and whole uncooked fish in the stalls waiting to be prepped. 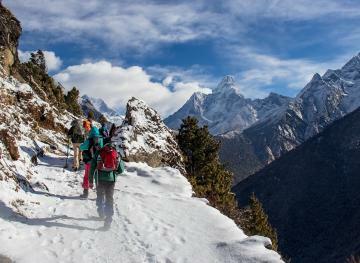 But you can alleviate your worries by following the locals’ lead and eating at stalls using fresh ingredients. Think about it this way: The more crowded the stall, the quicker the food is ordered, which means it sits uncooked for a very short amount of time. Long lines actually mean your food has a better chance of being stomach-friendly — and will probably taste better, too. Ready to indulge in this smorgasbord? 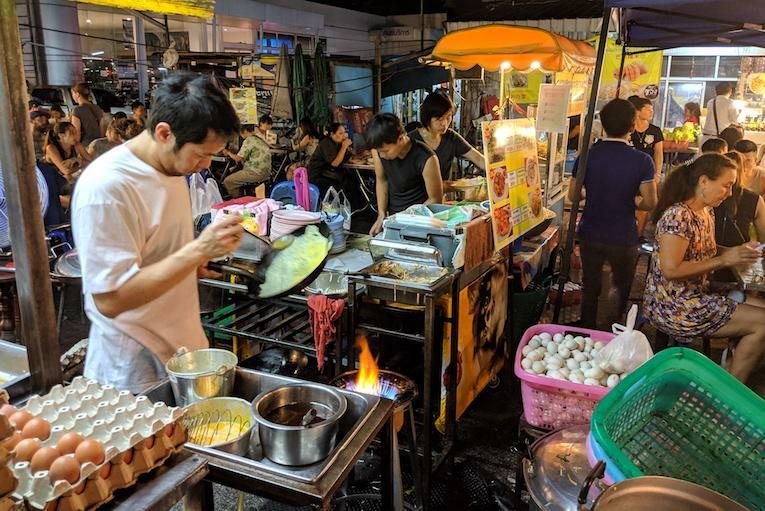 Some of the best night markets include Bangkok’s Rot Fai Market (for souvenirs as well as food), Yaowarat Road (for a mix of Chinese and Thai dishes) and the Neon Market (for epic photos of your food). 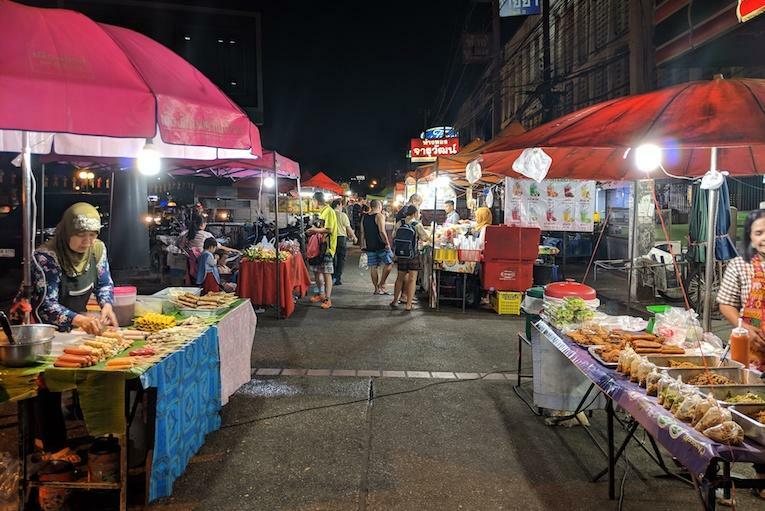 In Chiang Mai, head to Ratchadamneon Road or Chang Phuek Market.